Could eggs get more divine than this? The french have pretty much nailed it with this one in my book. This is one of the best ways to cook eggs and spoil all those around you, it’s a weekend favorite. Being superbly tasty and easy to make, it goes right to the top of my list for brekkie choices. You can also mix it up a bit by adding some chopped ham, mushrooms, spring onions and use herbs that you like. In this case I love chives and had them had home so used that, but they are also the traditional choice. Preheat your oven to 200C/400F/Gas 6. Place baking tray in oven. Bring a kettle full of water to a boil. 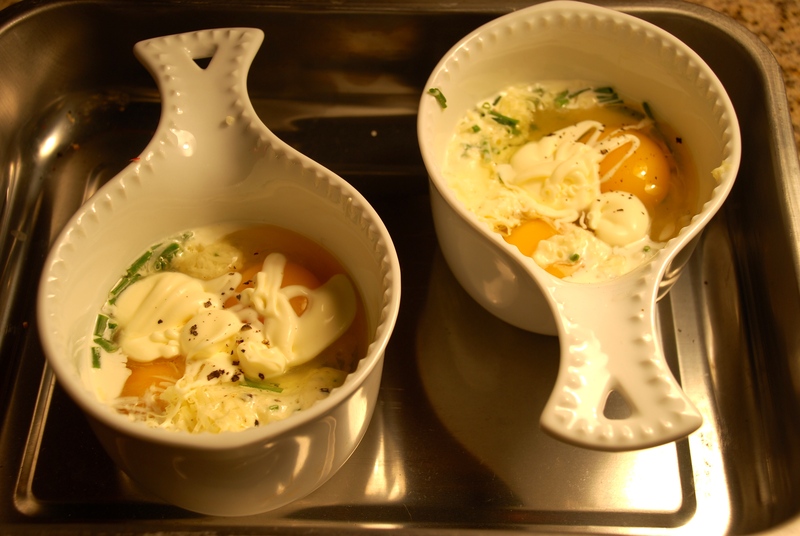 As it comes to a boil, assemble your eggs. Grease ramekins with a little butter. 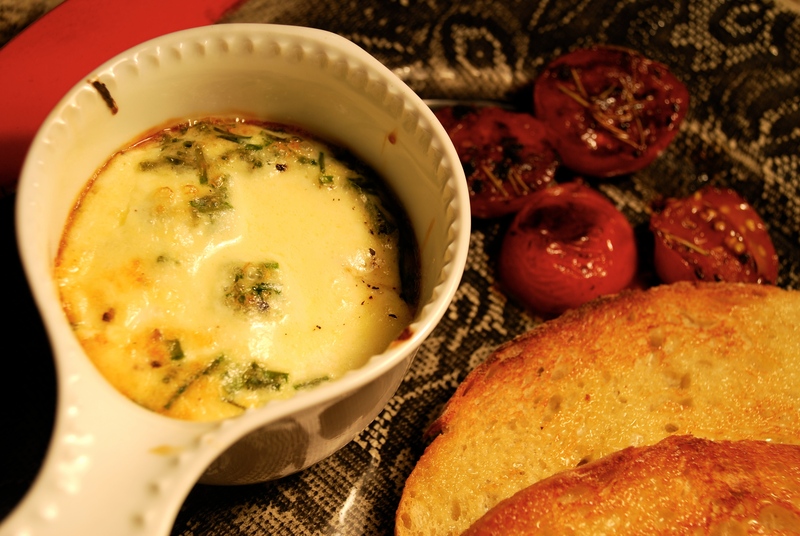 In the bottom of the two ramekins place a teaspoon of sour cream/crème fraîche and a teaspoon of cream, sprinkle some chives, and a teaspoon of grated gruyere. 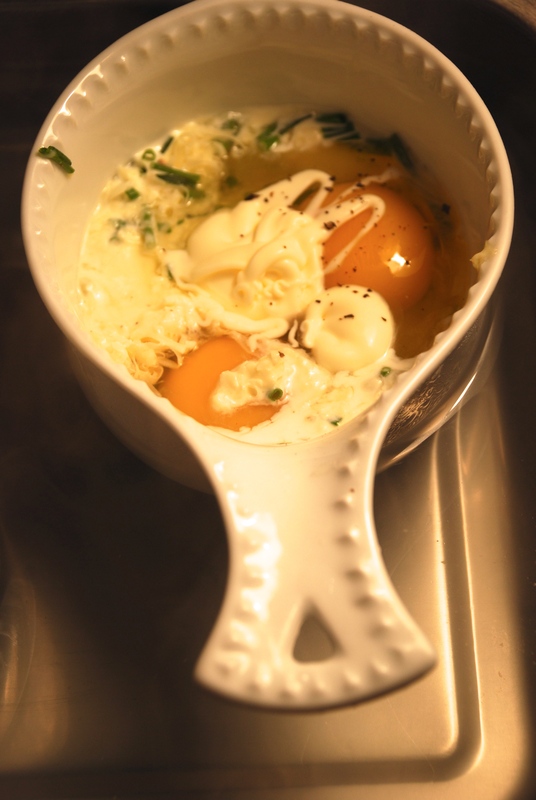 Crack two eggs on top of this and add another teaspoon of sour cream/crème fraîche, chives and gruyere. Crack some pepper on top (you can also place a little pea sized smidgen of butter on top, it helps to give brown specks on the top). By now your kettle should have come to a boil, so place your ramekins in a small tin, and carefully pour the water into the tin, so it comes up halfway on the outside of the ramekins. Place the baking tin with ramekins on top of the baking tray in the oven, and bake for 15-20 minutes depending on how runny you like your eggs to be. When the eggs are done, take out and serve with some really good quality french bread which has been toasted and sides of your choice. 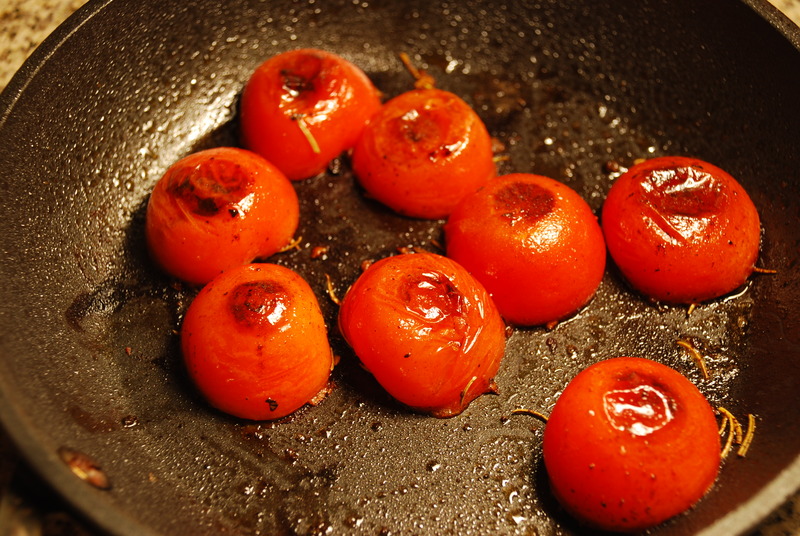 I like tomatoes.